better, your skin and hair feel rejuvenated and tangle free, and the chlorine odor is gone! such as acne, and other serious health risks. The SF220 uses a proprietary mix of KDF-55, Active Carbon and Calcium Sulfite to filter the water. removing chlorine in both hot and cold temperatures. (or after 10,000 - 12,000 gallons of water use) before it needs changing, to ensure optimal performance. PURIFIES YOUR WATER, PERFECTS YOUR SKIN - High output universal shower filter with REMOVABLE, replaceable multi stage filter dramatically reduces Chlorine, heavy metals (lead, mercury, nickel, chromium), bacteria, pesticides, and inhibits the growth of scale, algae, fungi, and mold LINKED TO dry, itchy skin, eczema, pustules, acne and ill-health so you LOOK BETTER, FEEL CLEANER & enjoy the skin you're in again! A "MUST HAVE" - REVITALIZE YOUR BODY IN 1 WEEK: USERS SAY "AMAZING!" "Within a WEEK my hair became thicker and healthy root to tip - TWO WEEKS my ACNE & DRY ITCH subsided" "My itchy scalp, acne & shoulder PUSTLES are GONE - this is an absolutely must have" ""I'm LOVING IT - no chlorine smell, shampoo lathers better, soap RINSES BETTER, super easy to install" "AMAZED at how different my eyes, skin and hair felt the FIRST TIME I used it!" PROMOTES HEALING & RESTORATION: Beyond the fact that our multi stage filter reduces dry itchy skin, dandruff and eczema it's unique multi stage filtration system is RECOGNIZED among THE BEST for dramatically improving the condition of your skin, hair and nails. WHY IT WORKS - UNIQUE, PROVEN BLEND of redox media, calcium sulfite, activated carbon quickly, easily and naturally eliminate all the yuck in city water, hard water and well water systems - as one customer said, "I never noticed the chlorine smell before but now that I have this in my shower, my sink water drives me crazy!" 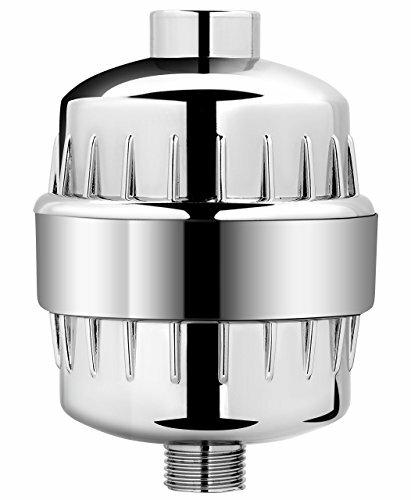 NO TOOL, 2 MINUTE INSTALL - MONEY BACK GUARANTEE: Simply unscrew your current shower head, screw in our universal high pressure shower filter, then reattach your shower head - No Tools Required. It's guaranteed to DELIVER RESULTS and work with all shower types including fixed, rain and handheld shower head filters and leave you feeling 100% THRILLED with your healthier skin, hair and nails or your money back. If you have any questions about this product by AquaBliss, contact us by completing and submitting the form below. If you are looking for a specif part number, please include it with your message.